Well it’s fair to say that the care-free days of summer have long passed out of sight from the scope of your helmet mirror. No more Sunday Parkways in your Birkenstocks. No more putting off buying those fenders, and that sweet bike you picked-up at a yard sale and rode away on just won’t cut it anymore. Indeed we have begun the plunge into the rainy season and, if you’re hoping to avoid retiring that rusty-steed for the next 8 months, you might be in need of a few upgrades to transform your bicycle from a fair-weather, to an all-weather friend. I recommend upgrading one of the most important parts that connects you to your beloved bike— your pedals! Those broken plastic pedals or those cruiser pedals that slip in the rain or those uncomfortable clip-less pedals that you never got around to finding shoes for, are not going to do you any favors as you power though these dark damp days. So what will get you on sure-footing without making you financially insecure? I’d recommend the Lo-Profile Platform Pedals from Redline. These loose-balled, dual-sided, all aluminum bodied pedals provide a wide pressure distributing platform with 11 “grippy” studs on each side. They are comfortable and provide security, whether you are wearing your summer slip-ons or your wintery XTraTuf boots. And at $20, these pedals are competitively priced. But what separates these “Lo-Profile” pedals from the rest is that they are indeed a low-profile pedal, a full 25% narrower than similar platform pedals at this price. A thinner pedal reduces your likelihood of striking the ground, potentially causing you to loose control as you round those slippery leaf-matted corners. Installing new pedals is only $5 at the Community Cycling Center bike shop. Swap out your old pedals today and you will be amazed by how much more comfortable, safe and efficient your bike can feel as you slog through these wet Portland months. 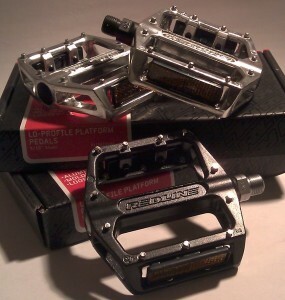 Redline Lo-Profile Platform pedals come in both black and silver and are only $20 for the loose-ball model (pictured). A cartridge bearing model with replaceable studs is available for $54. If you have any questions, our friendly mechanics would love to help you out.